↑ "Most Beautiful: Paul Sereno". People. 1997-12-05. Retrieved 2013-11-24. ↑ Dell'Amore, Christine (14 August 2008). "Ancient Cemetery Found; Brings "Green Sahara" to Life" (Web). 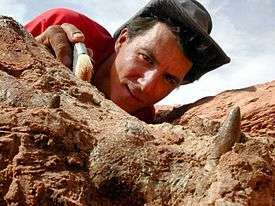 News article about; Dinosaur hunters have stumbled across the largest and oldest Stone Age cemetery in the Sahara desert. NATIONAL GEOGRAPHIC NEWS. Retrieved 2008-08-15. ↑ Gwin, Peter (September 2008). "Green Sahara" (Web). Feature story about; Lost Tribes of the Green Sahara - How a dinosaur hunter uncovered the Sahara's strangest Stone Age graveyard. NATIONAL GEOGRAPHIC. Retrieved 2008-08-15. ↑ "Skeletons of the Sahara" (Web). PBS. Retrieved 2013-08-24. 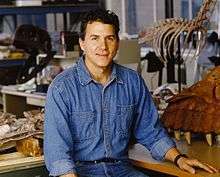 ↑ "Filmography | Paul Sereno - Paleontologist | The University of Chicago". paulsereno.uchicago.edu. Retrieved 2016-08-09.